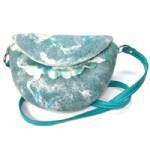 Small purse from handmade art felt in shades of turquoise and green with accents of white cotton and silk. It is approximately 10" wide, 8" tall, and 2" deep. A pair of super-strong concealed magnets hold the flap shut. The plain, unlined interior is cream colored wool, and the turquoise leather strap is long enough to hang over your shoulder.